1. Player 2 passes it to Player 1 and skates hard behind Player 1. 2. Player 1 than passes to Player 3 and skates hard behind Player 3 and so on. Good drill to sharpen up the passing and for conditioning. Do it for about 5 minutes. 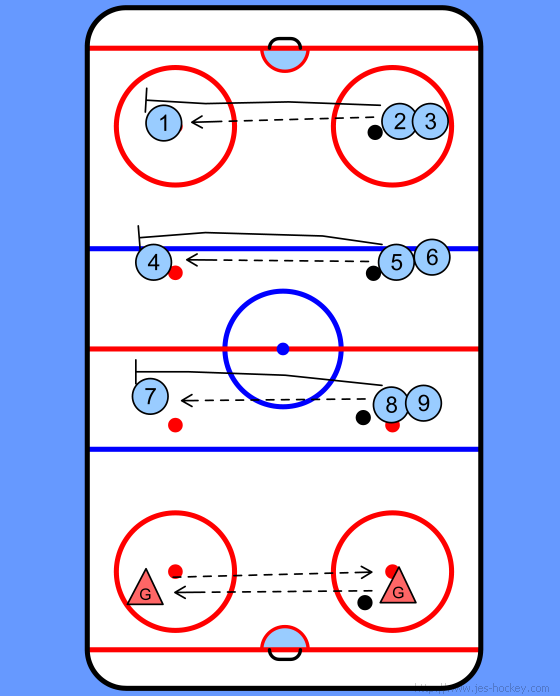 Make sure Players are skating hard to their spot and stopping rather than turning half way there. Also make sure Players are ready in their hockey stance and prepared to adjust when waiting for the pass.